It is the last day of the cycle ride and I find it difficult to roll out from under the warmth of the duvet. There is a chill in the early morning air as we are collected and driven back to the Hyde Cafe for a delightful cooked breakfast. As our ride weaves it way back to the Hyde township I capture the homestead looking beautiful in the morning light. The cycle will be short today so we relax and enjoy the smell of freshly roasted coffee, sizzling bacon in the pan and the friendly murmur of other cyclists preparing for the day. The gravel road leads us out of town passing derelict train carriages rusting from neglect. 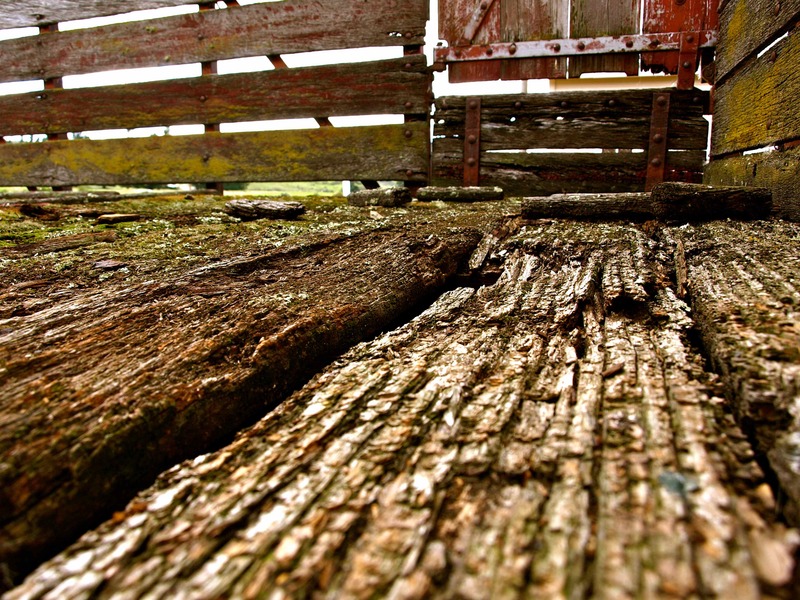 The crumbling wood and metal turns into a playground for us. We stop to explore, climbing in and around the skeleton carriages like energetic children on a climbing frame. Back in our saddles we pedal through overgrown fields pausing at the Hyde Memorial to learn about the Rail disaster where 21 people died. 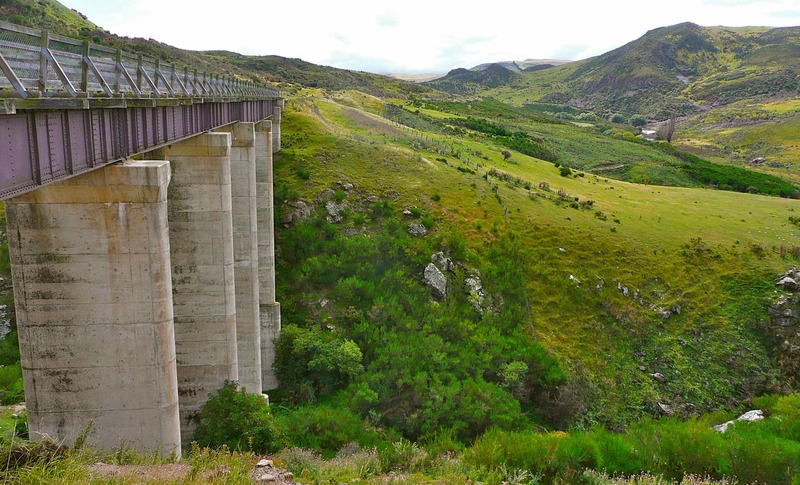 In 1943 the Cromwell to Dunedin passenger train derailed on a curve some three kilometres south of Hyde station. The mountains painted in the foreground envelop the land like a green velvet coat. 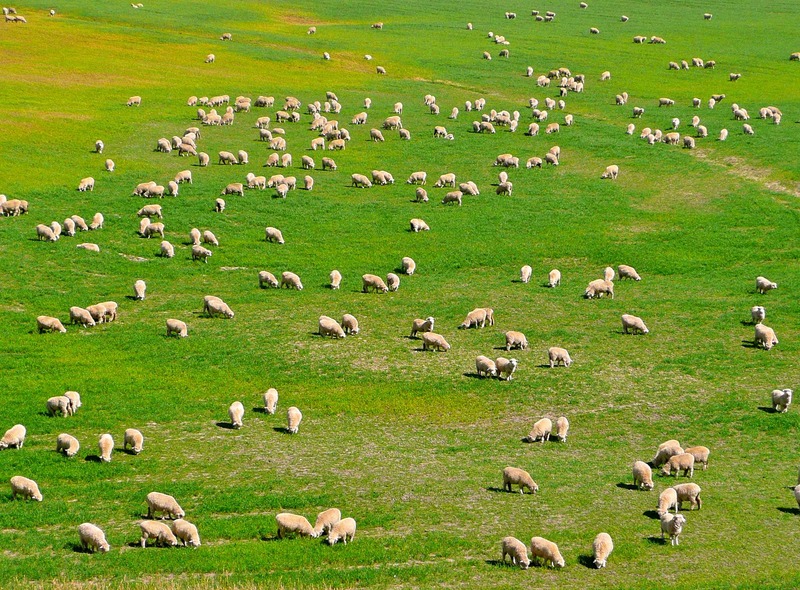 The land is rugged and wild as we cycle through the abandoned space where the crisp leathery grass sweeps the air and fat fleecy sheep ignore our presence as they greedily devour grass. Jagged outcrops of Schist rock begin to appear like lumps of play dough left to harden. 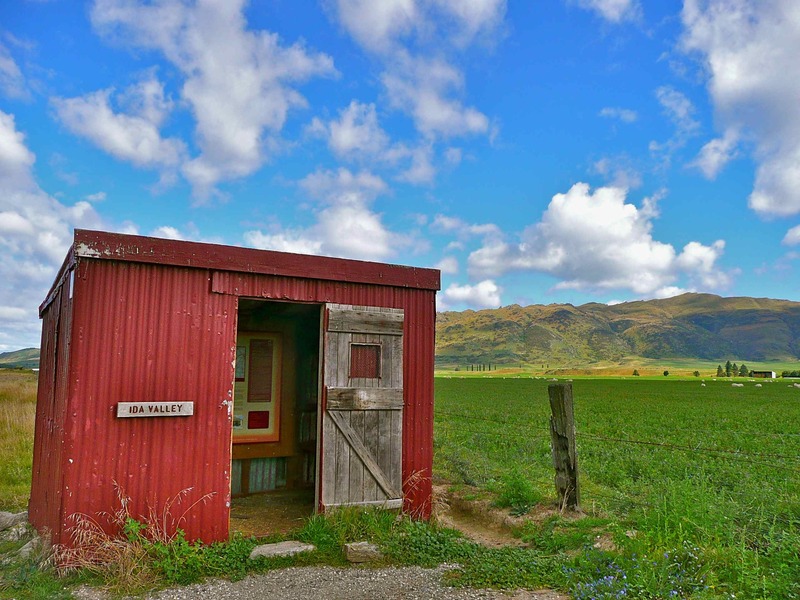 Empty and alone, the derelict huts stand forgetting that they are in the fine company of the majestic Otago mountains. With a determination to reach the end. Our bicycles hobble over the hundreds of tiny rocks as our legs push onwards only slowing to avoid lazy sheep resting on the trail. A clash of drizzling rain and grey clouds releasing golden shafts of sun highlight our arrival. We proudly pedal into the wide open streets of Middlemarch. 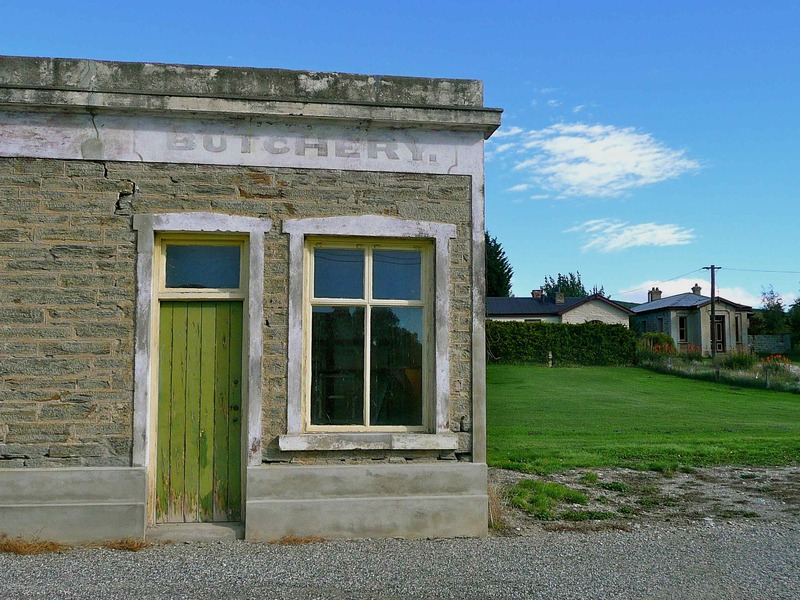 To celebrate the end of the Otago Rail trail we cycle down the main road to the local dairy ( corner store ) for a delicious Deep South ice-cream. 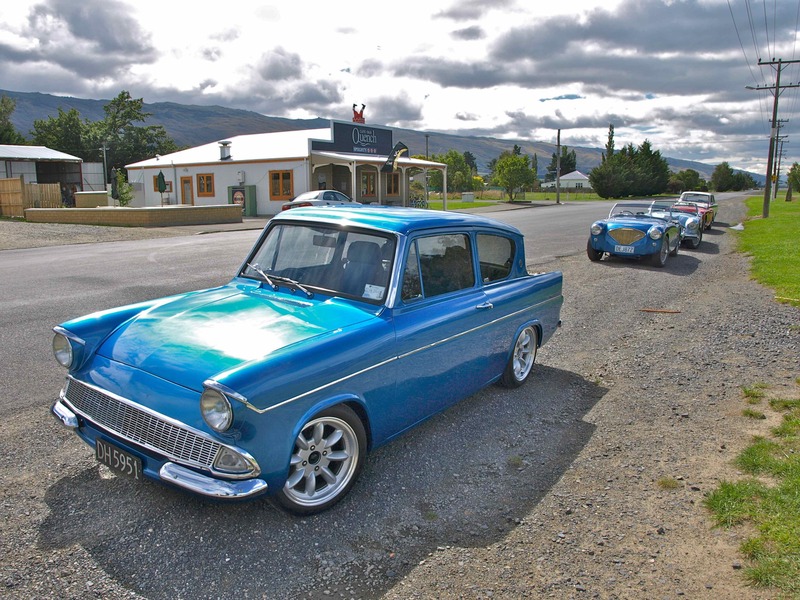 We hear the purring of engines and see that we are not the only strangers in town as a small succession of classic cars cruise into town looking suited and booted – gleaming for admiration from others and easily getting it. We hand our muddy, dust-covered bicycles in at the bike shop and join the proud classic car owners at the local eatery for a spot of lunch. Sadly, our cycle journey has ended, but our day is not over yet! 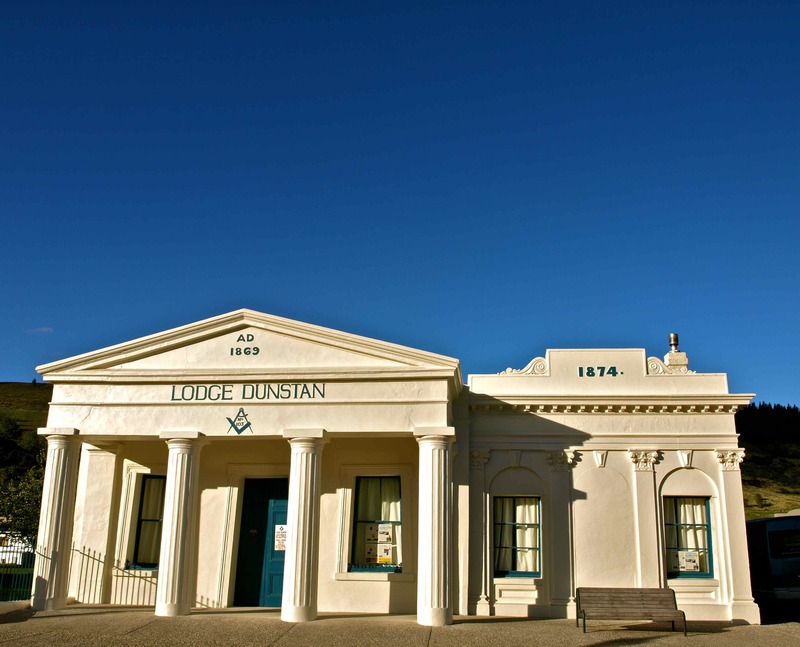 We have one last big journey to undertake which will take us all the way to the historic city of Dunedin. 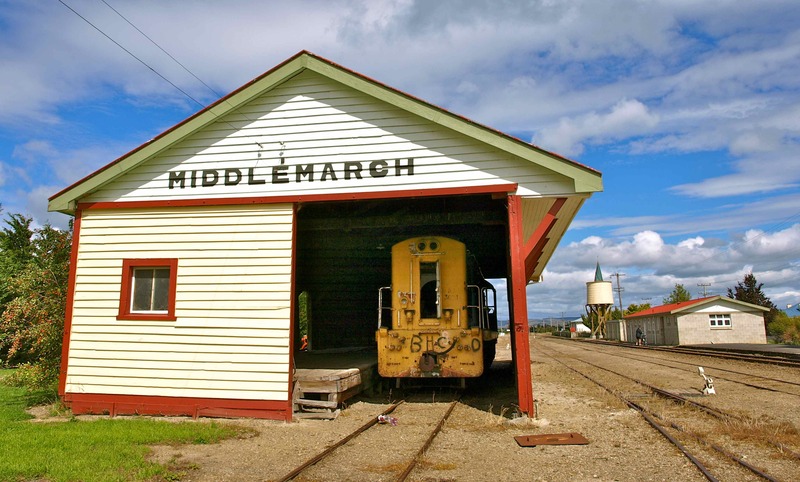 The final leg of the trip is to take a ride on a train – the powerful machine that use to travel along the Otago rail trail all those years ago. 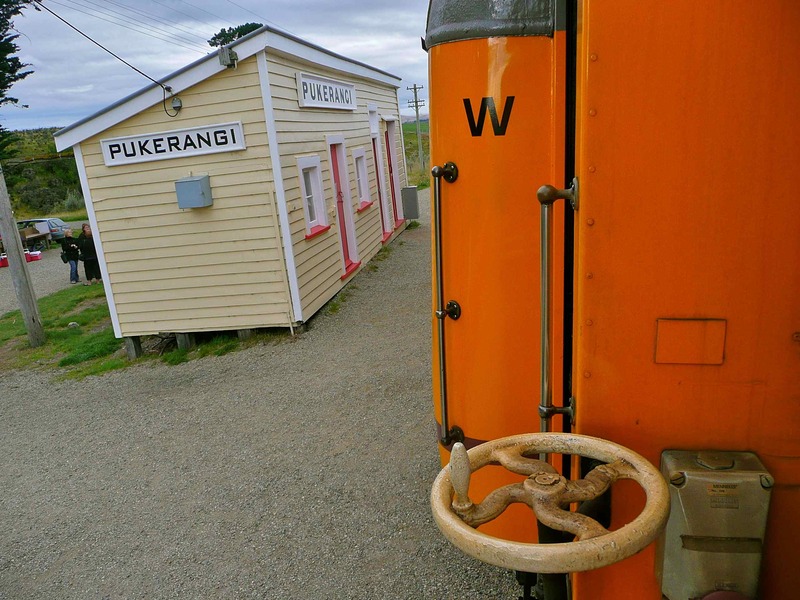 When the time came we were driven to the tiny station of Pukerangi to catch the train. 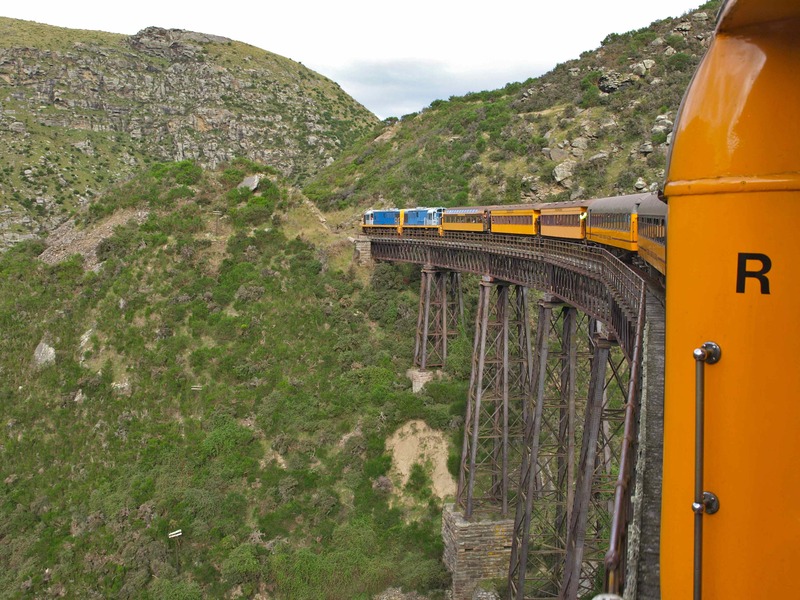 This train would take us through the famous Taieri Gorge on a railway line that was carved by hand over 100 years ago. I stood out the back of one of the bright orange carriages with the cool wind in my face eagerly enjoying the slight pull on my long hair as it twisted and swirled in the clasping air. 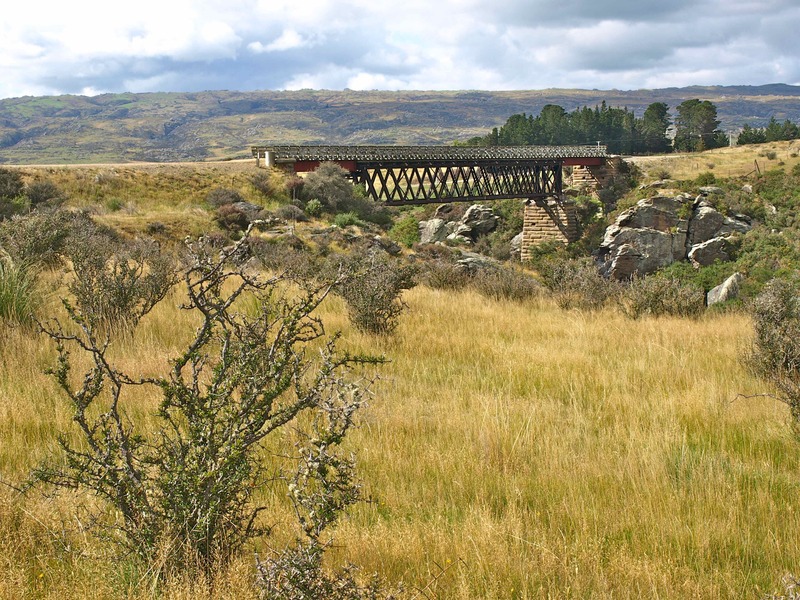 The train chugged us along immense wrought iron bridges, through lengthy dark tunnels, over massive crevasses and past towering slopes of earth as it followed the river flow far below. It is so exhilarating to have nature looking so dramatic and wild while cooling you with her icy fingers. What a ride and what a journey! 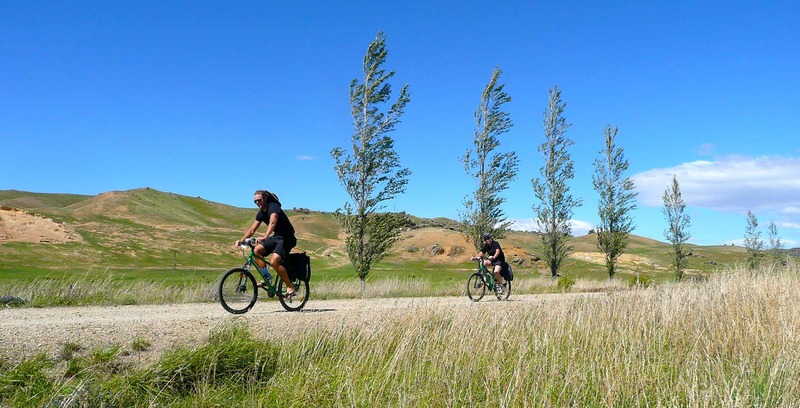 It felt good to be back on the bicycles as we pedal away from Ranfurly. The morning gives us big rolling grey clouds and the air is chilly on our skin. 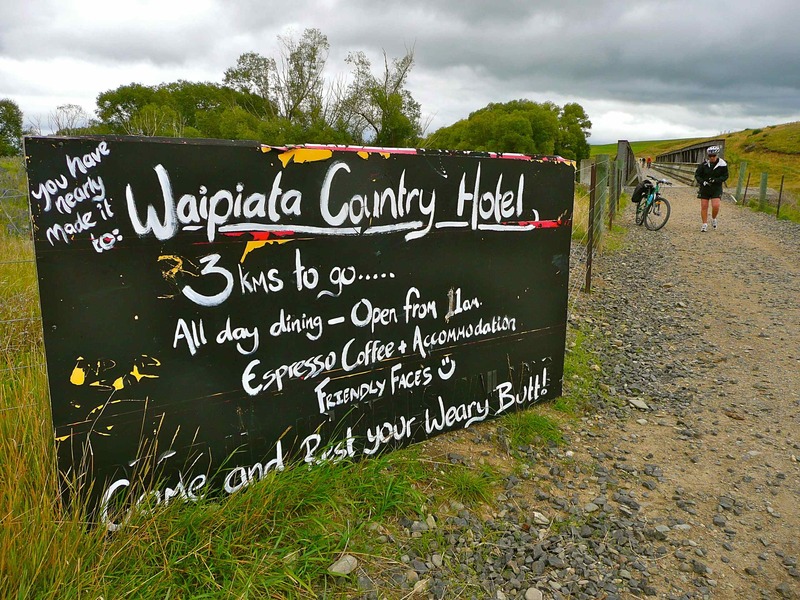 We adorn our warm clothing before disappearing from civilization into the quiet isolation of the Otago Rail Trail. 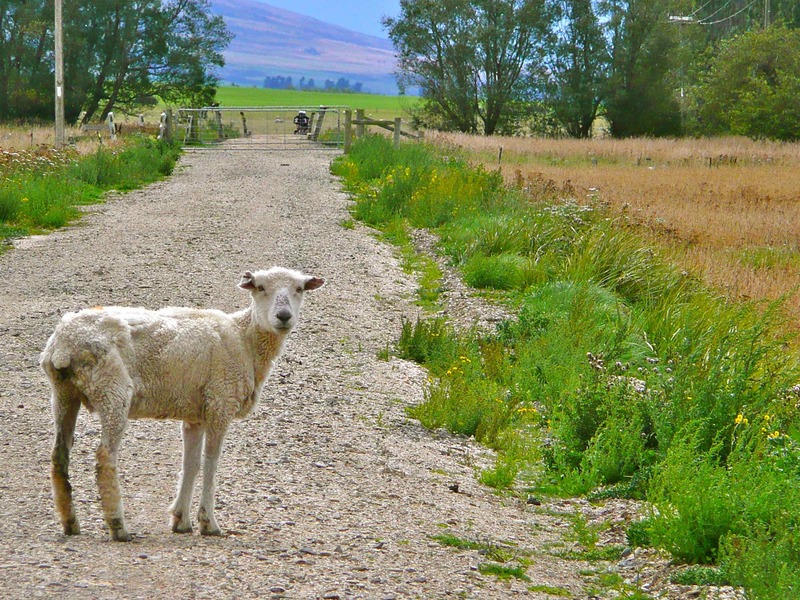 The gravel trail lead us through vast areas of grassy fields littered with hundreds of cotton wool balls of sheep. Their curiosity has them staring and bleating like crazy. We have arrived as entertainment for the masses. We are like celebrities, but only for a few seconds in passing. 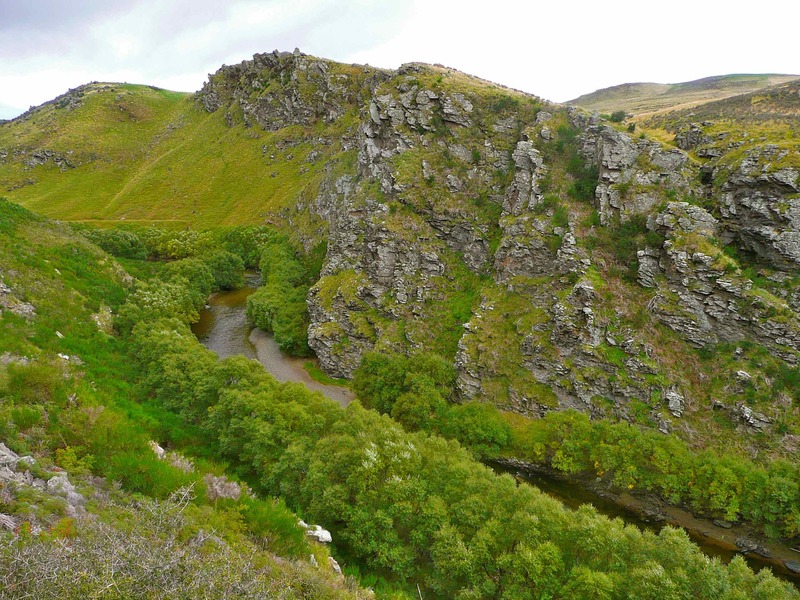 A small gorge climb is conquered with ease – our legs have become accustomed to the inclines allowing us to enjoy the spine tingling views with gusto. We pedal onwards and back into civilisation for a brief moment. 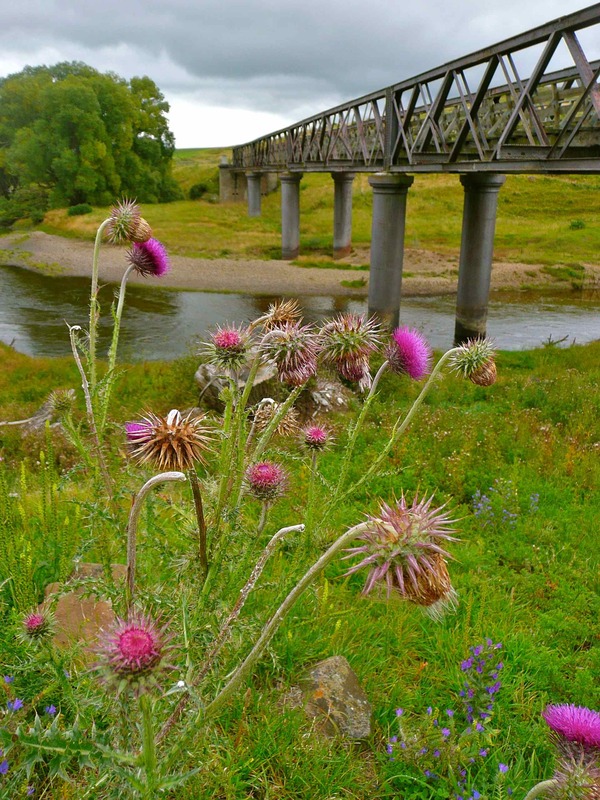 The tiny town of Waipiata, once a busy railway construction camp also known for where the giant Moa bird once roamed – it is now a tranquil place to relax and play as it sits next to the popular Taieri river, a river the trail continues to follow. 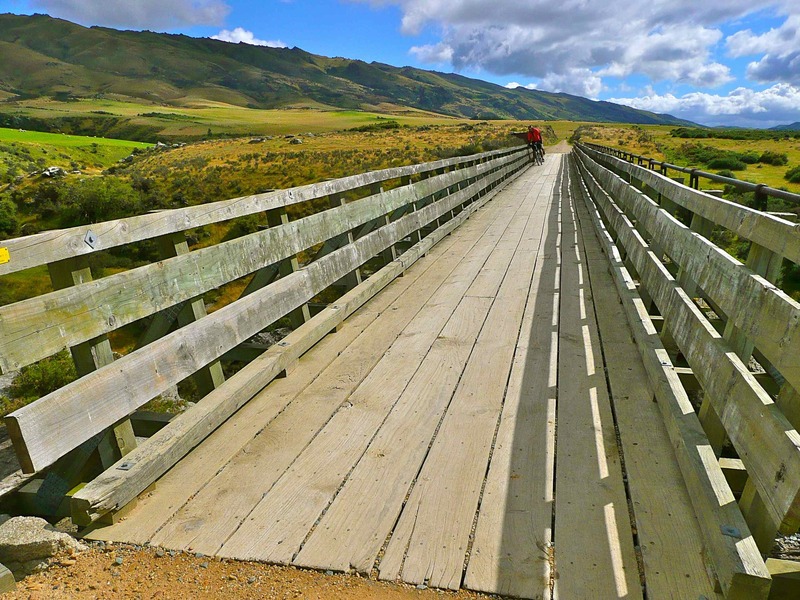 A few kilometres out of Waipiata we pedal over the impressive iron work of the ‘Green Bridge’ which was constructed in 1896 and still standing proud. We cycle through places bearing the names of Kokonga, Tiroiti and Daisybank. 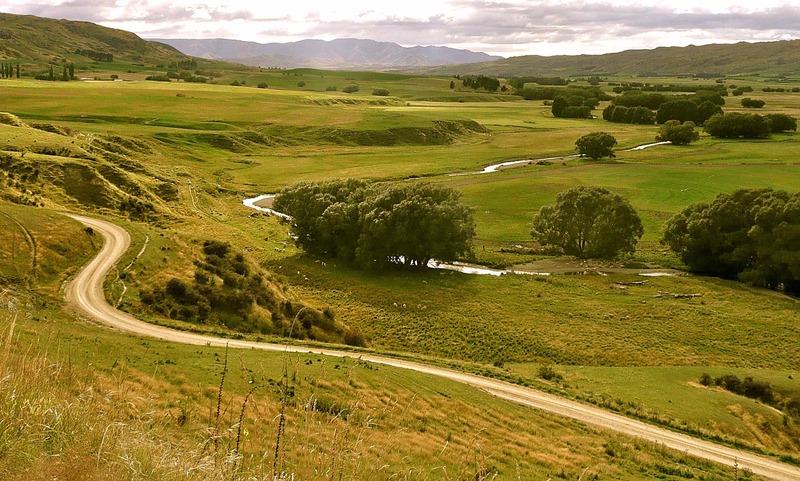 The Taieri river snakes its way through the land. Gliding over hay bale pastures before cutting deep into the earth creating deep pockets and mighty crevasses. Like a soap opera the scenery becomes more dramatic with each curve in the trail. My senses are mesmerised and I find myself often stopping to indulge in the beauty around me. Our ears, noses and hands begin to get numb from the ice-biting breeze when, like a shining apparition, we pedal upon a lone coffee cart shining under the grey clouds. The stop is a welcome treat. 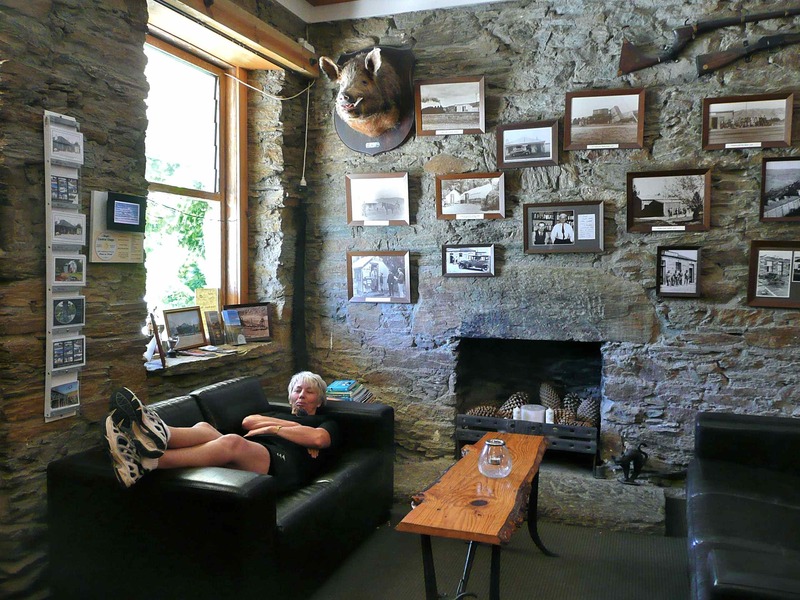 The jolly owner enjoys our arrival as we throughly enjoy drinking his warm delicious liquid gold. Back in our saddles our legs spin quickly to stay warm. Prices Creek tunnel and the town of Hyde are not too far, but it isn’t long before our cycling effort is slowed. We spot apples trees on the trails edge full of bulging baggage. We stop and munch greedily while the heights of another lush gorge waits for our arrival to treat us to its impressive wares. Decorative tree patterns, steep cliff plunges and the spooky Prices Creek tunnel – What more could you want? 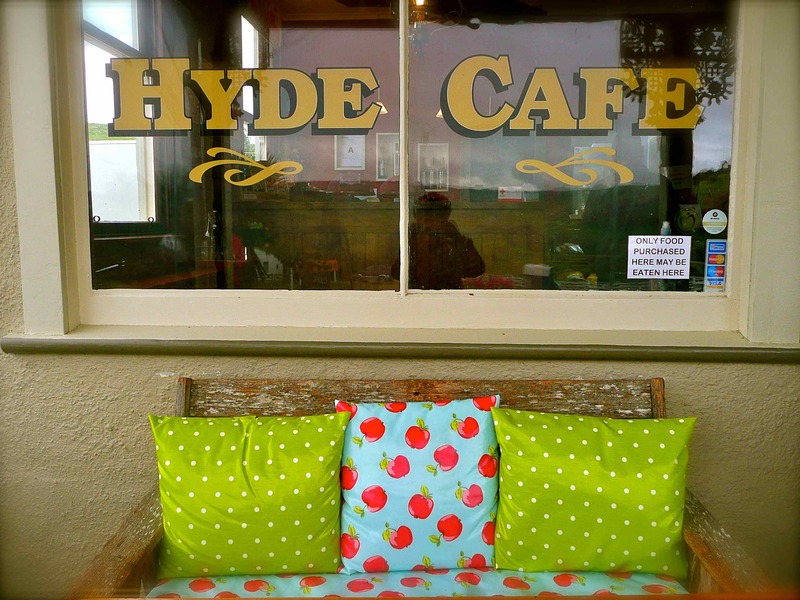 After the thrill of the ride we finally arrive in historic Hyde. 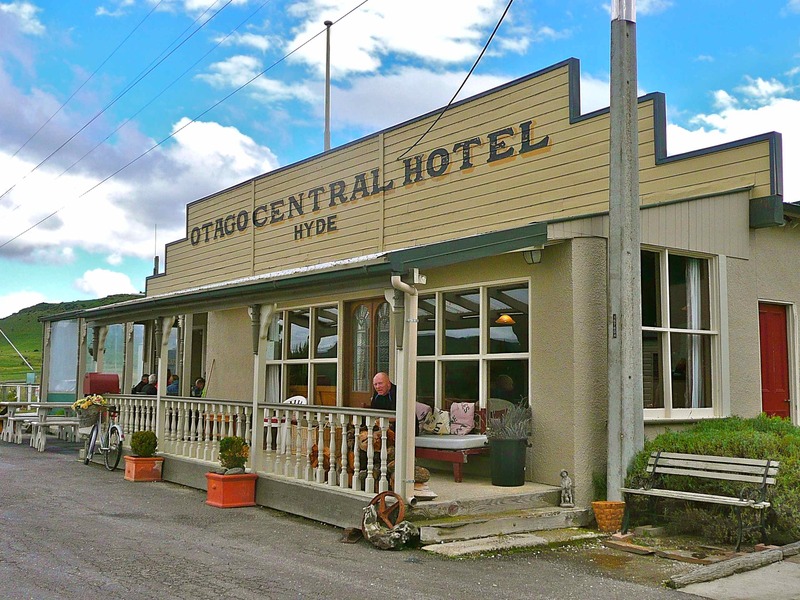 We pull up at the Otago Central Hotel to have a late lunch and to wait for our transportation to our nights accommodation. 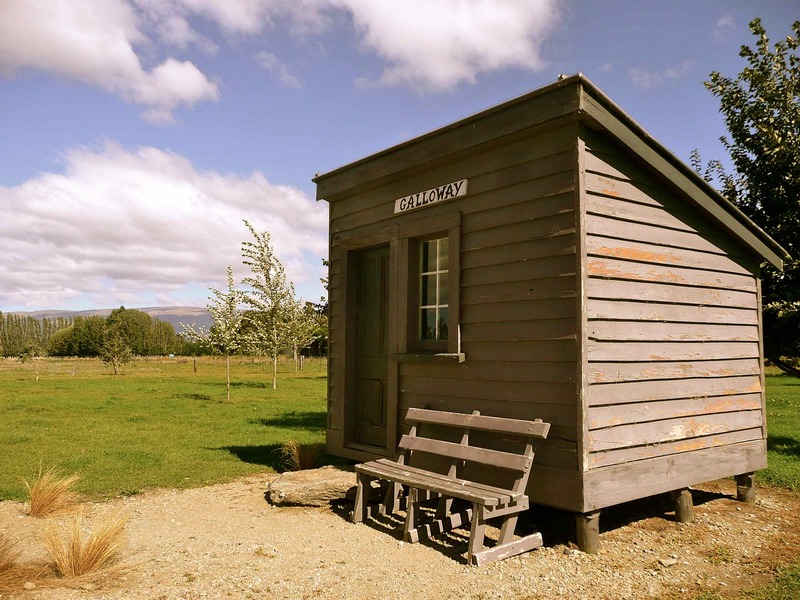 The Rocks Station, an old Merino Station is definitely a wonderful surprise. It is an old homestead just for the three of us! 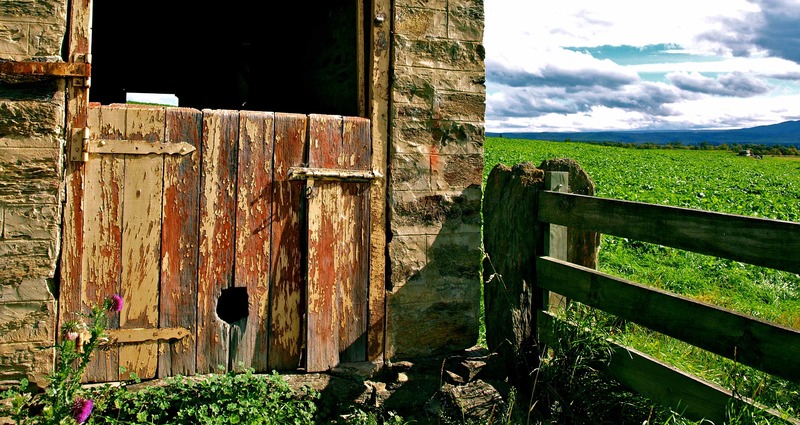 We spend the late afternoon exploring the house, its river, derelict sheds and the remains of the historic moss-covered stone sheep yards before heading out for a fun-filled evening at the local pub. The three bicycles are sadly locked up as we drive away from the art deco town of Ranfurly in our hire car. 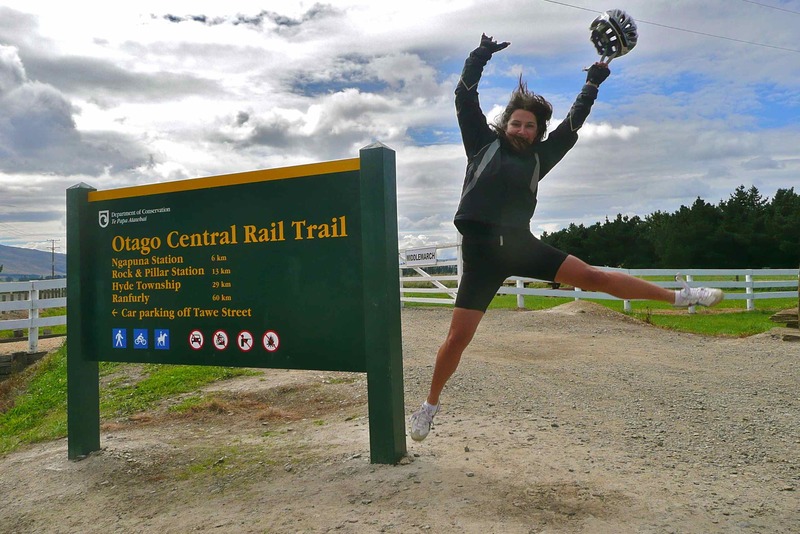 Due to time and for one night only we sadly swap two wheels for four to explore parts of the Otago Rail Trail. 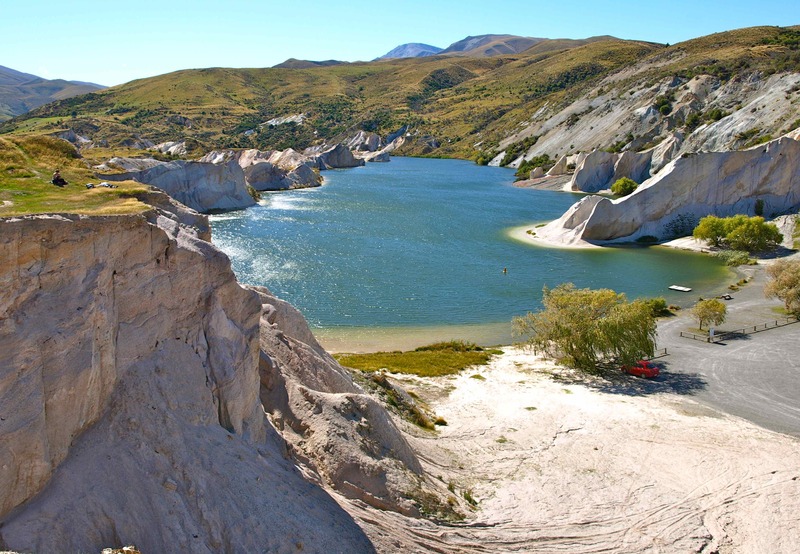 With the sun high in the sky we weave our way towards the tiny historic gold mining town of St Bathans. 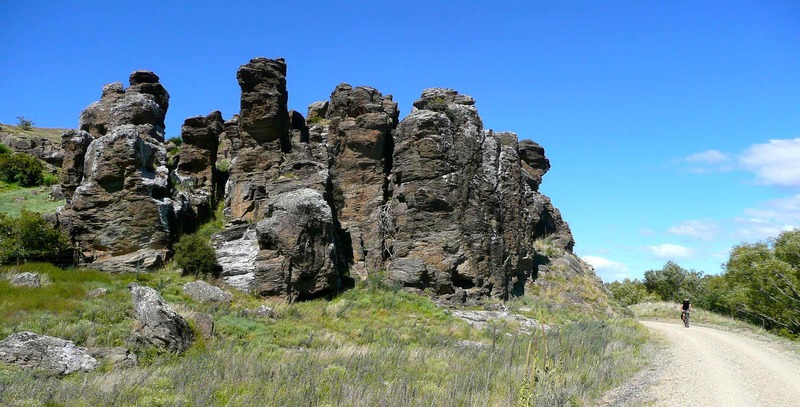 It is tucked away in the depths of the Maniototo plain as if it likes to hide from the present day. 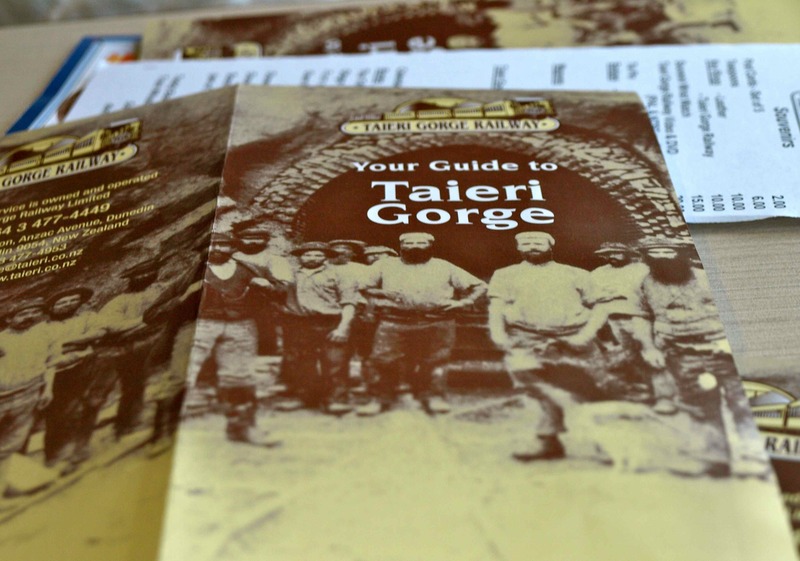 Its few remaining historic buildings are great for capturing the belief that gold could still be found in the area. 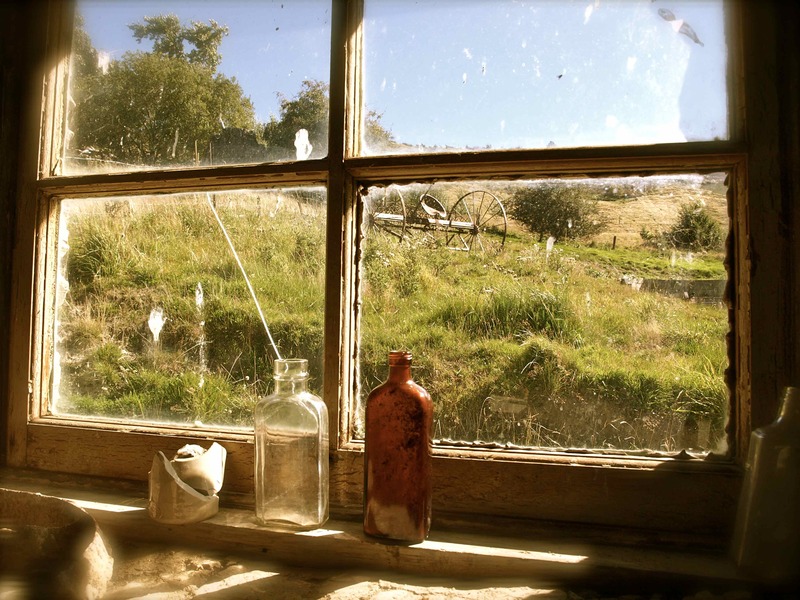 We peek in and around the creaking rooms and cloudy windows where dust has gathered and cobwebs have formed before strolling down the empty road to the old mined lake. The man-made Blue lake is worth admiring with its white washed cliffs. If it had been a hot day I would certainly be splashing about in its mineral rich depths – What a beautiful sight! Back in the car and on state highway 85. 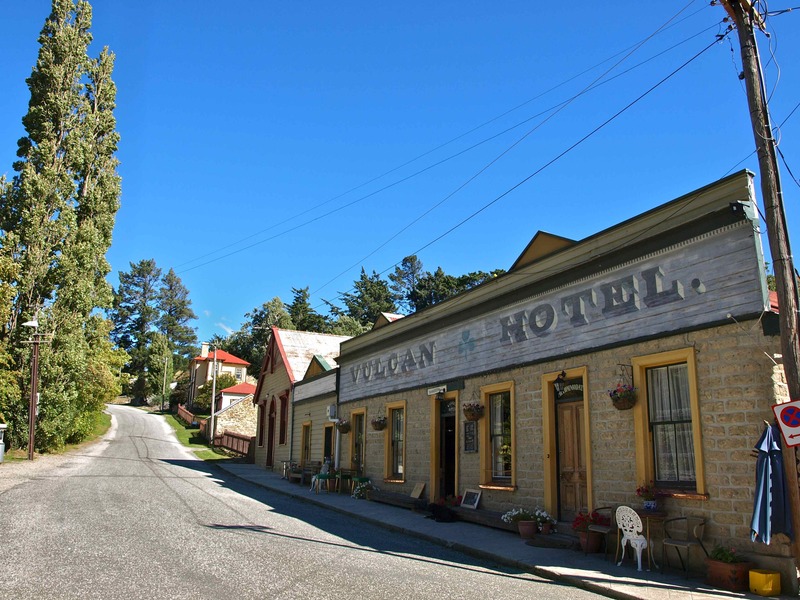 It twists its way towards Naseby – another historic gold mining town. As we drive into the tiny town the afternoon light glistens through the towering trees upon the historic buildings making their unique character twinkle with pride. The main street feels as if time stopped long ago and life is still being lived as it was a 100 years ago. 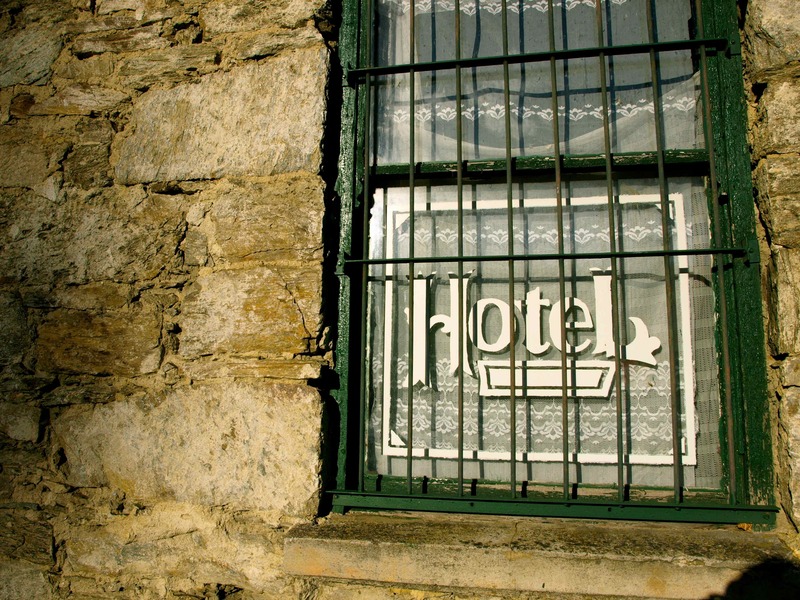 We find our accommodation very easily. 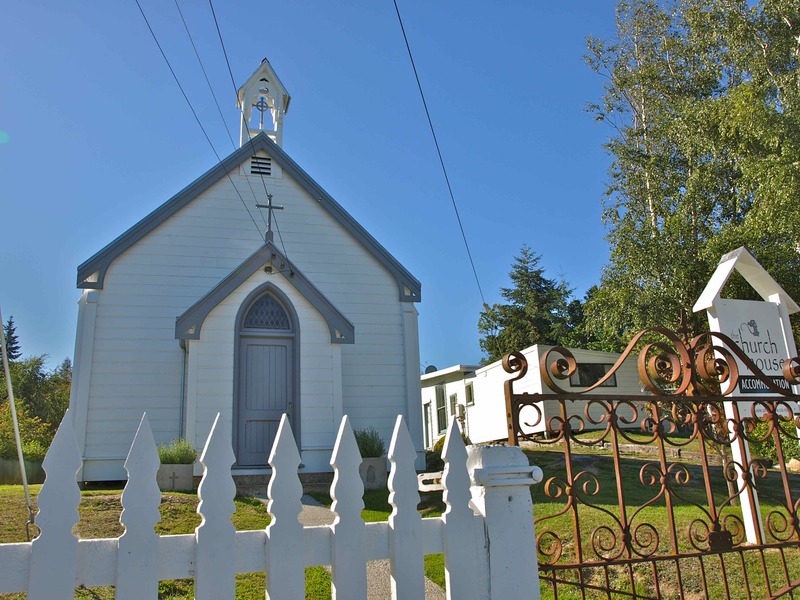 What was once a local church has been beautifully converted into a bed and breakfast, but we have no time to relax. We have a pre arranged date for the evening. 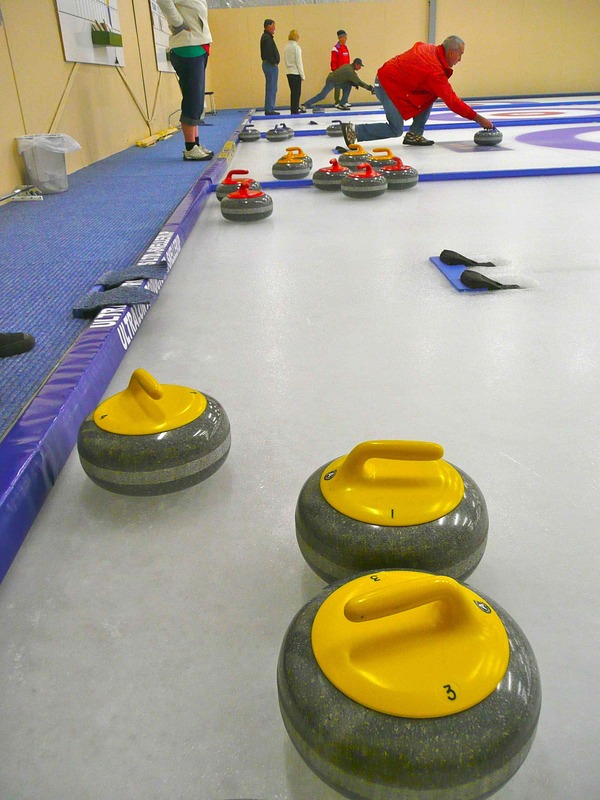 We wrap up warm and head off in search of the local ice rink to try the sport of curling. The friendly locals are already energetically sliding the colourful stones over the ice. The clinking of stones is constant and the murmur of chatter creates a busy scene. Upon arrival we are given instructions on the game and encouraged to practise before playing. This is helpful as sliding huge stones over ice isn’t as easy as it seems. Our curling games are fun, yet challenging. We all compete to battle it out against each other. We leave the chill of the ice rink with smiles on our faces and head in search of dinner. We find a fabulous place under the sparkling night sky called The Falconer, with its outdoor fire, locally sourced food and delicious wines it is perfect! Finally we snuggle up warm for our night in the old Church. I am woken from my sleep by an angry storm. The church’s wooden structure creaks and groans with the buffeting wind and heavy rain. I have visions that the church and I will be whisked up into a wild tornado just like Dorothy in the Wizard of Oz and I keep my eyes wide open for hours! It is early morning, the gold mining towns of St Bathans and Naseby continue to snooze. Our four-wheeled vehicle is up early and moving. 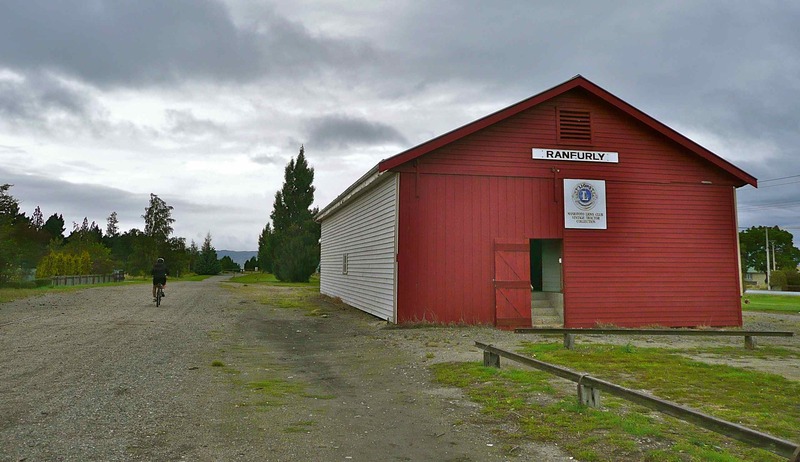 It returns us back to present day, to the town of Ranfurly and happily reuniting us each with our beloved two wheels so we can begin day three of the Otago Rail trail! 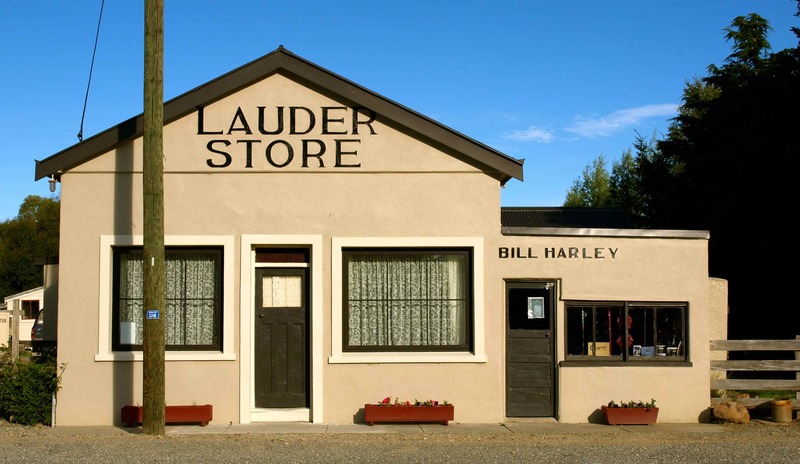 A fresh blue sky awaits us as we mount our bicycles to leave the town of Lauder while it has a lazy lie in. 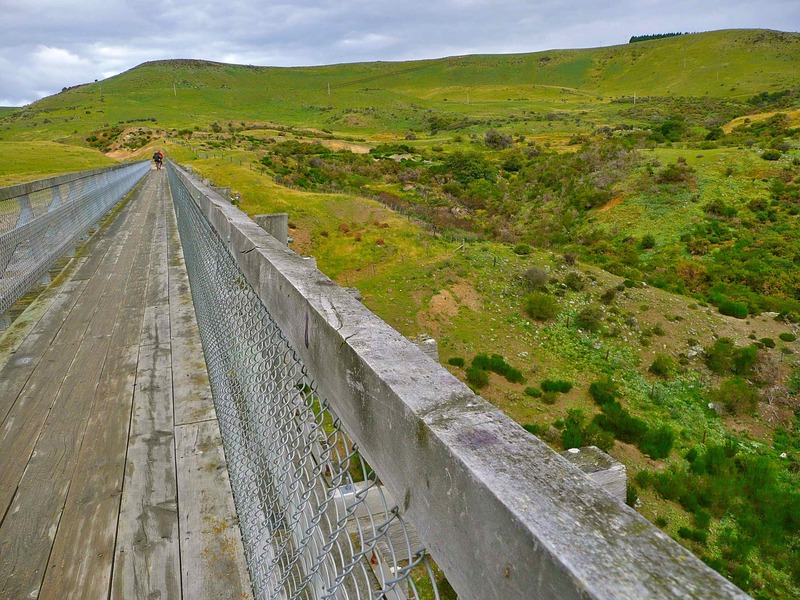 Our legs quickly spring into action as they continually spin the pedals taking us further into the Otago region. 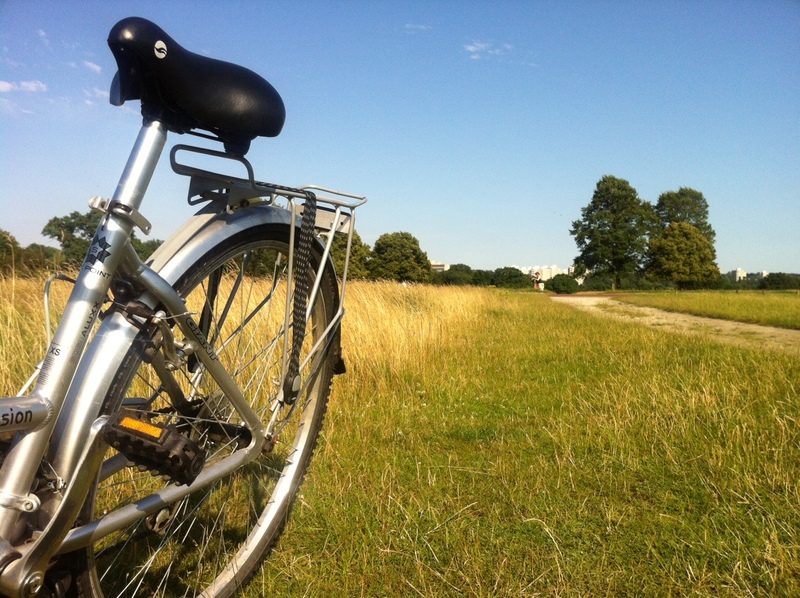 We feel relaxed and enjoy the morning sunshine on our backs as our bicycles bump along the gravel trail. Beautiful old railway bridges welcome us. We manoeuvre our wheels over the rustic wooden planks as the intricate metal structures of the bridges radiate their strength to hold us above the huge crevasses below. Patiently a dark tunnel sits, cut into the rock it waits for daring new customers to enter its damp, dark space. We take the dare and pedal at top speed, hollering and hooting all the way through the dark beast until the light swoops us up safely in its arms. Pedalling onwards we cruise happily through the Ida valley with a back drop of bare mountains and green pastures. 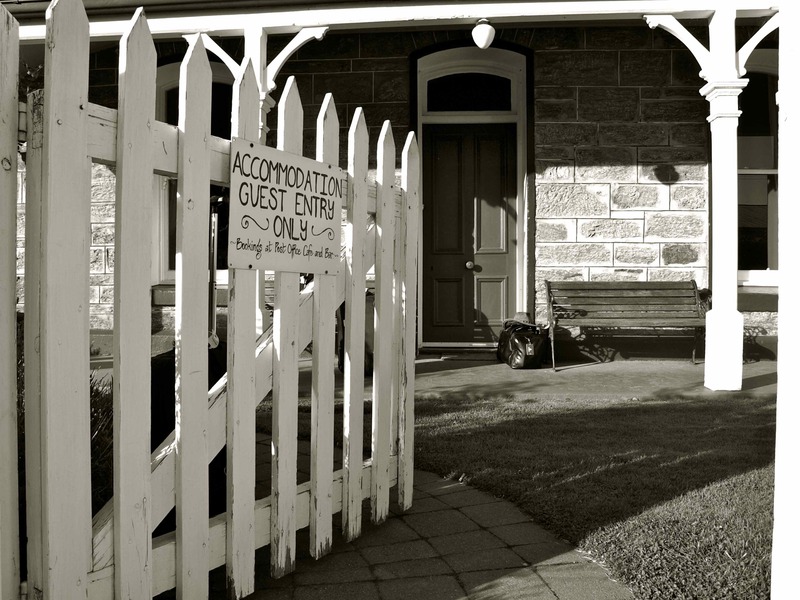 The mud-brick Railway Hotel still stands proudly alongside the trail from the early 1900s looking isolated. 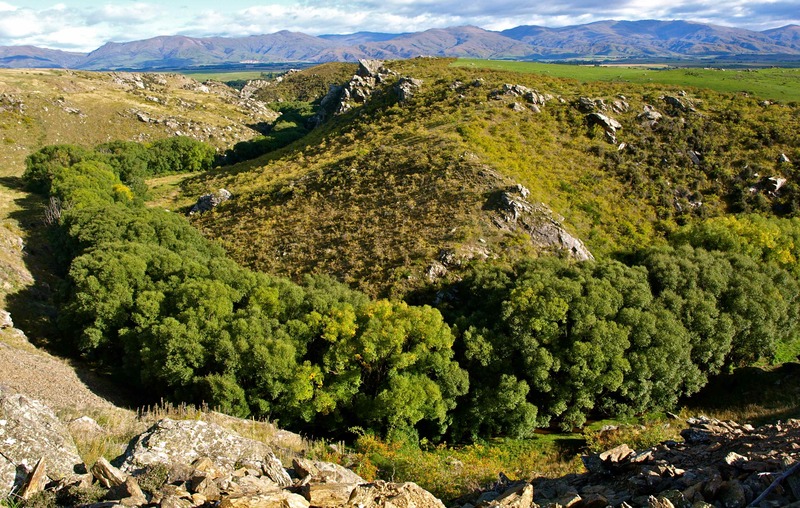 Next stop is Oturehua. 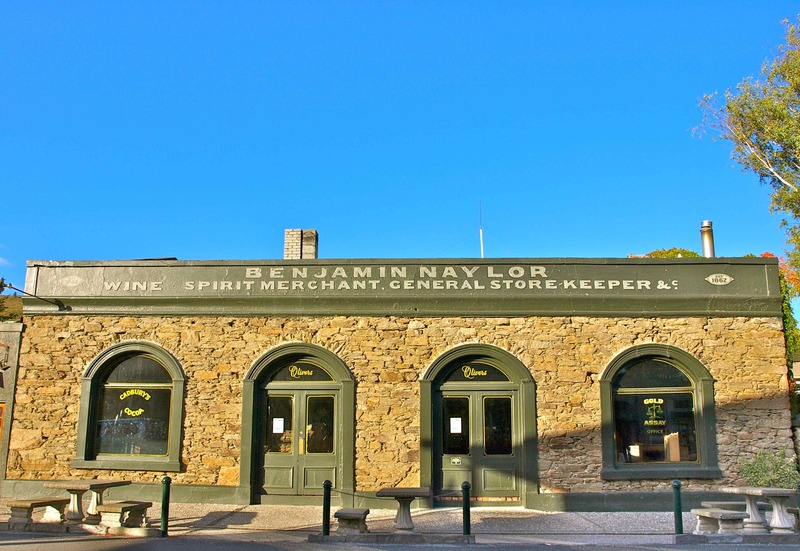 It is a gem of a town dotted with a handful of dated buildings. 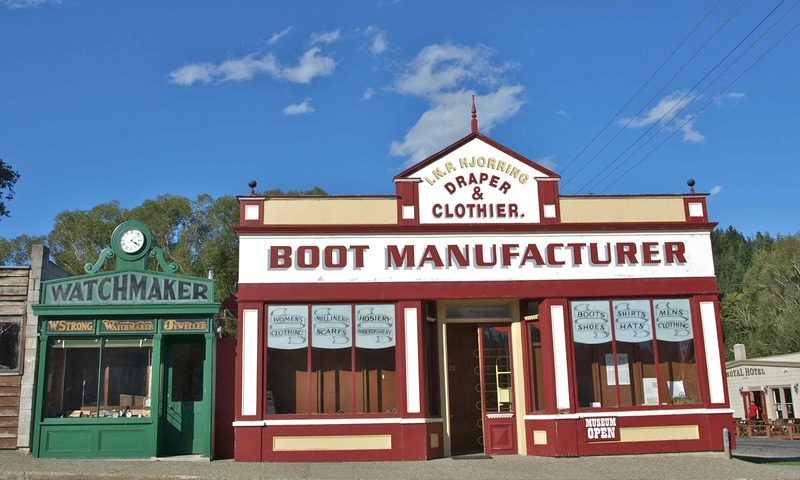 We stop for a greedy lunch and take a step back in time in the famous Gilchrist’s store. 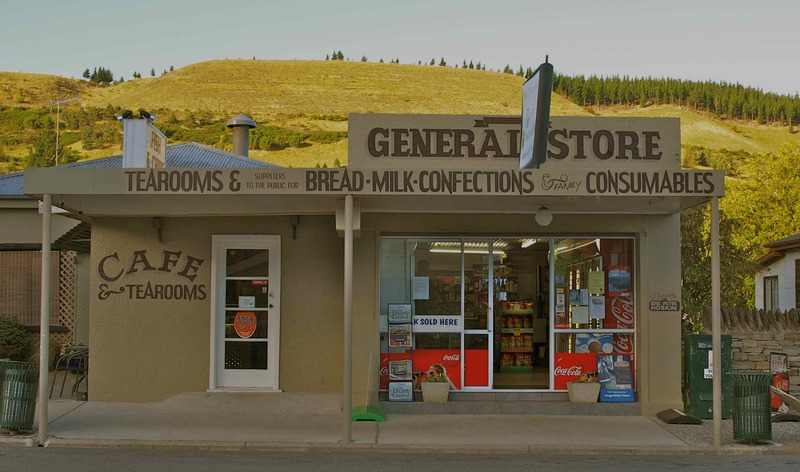 It is New Zealand’s oldest continuously operating general store and is full of goodies for any traveller. 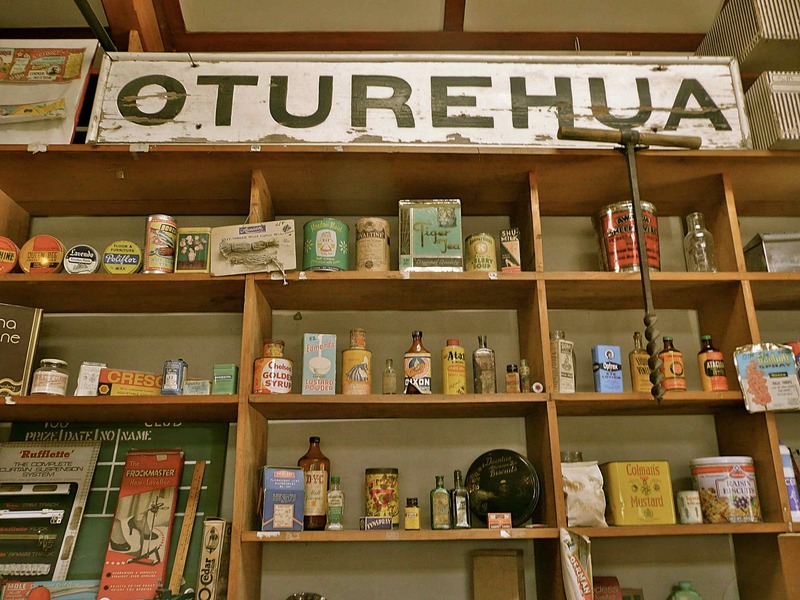 It has a huge section displaying a number of nostalgic ‘Kiwi’ products bearing long-gone brands. I have to say I fell in love with the store – I was giddy with excitement I felt like a kid in a candy shop! The trail continues its way onwards along the gravel travel and past the mountain peaks to the small settlement of Wedderburn. With the time ticking by we decide not to stop and carry on. 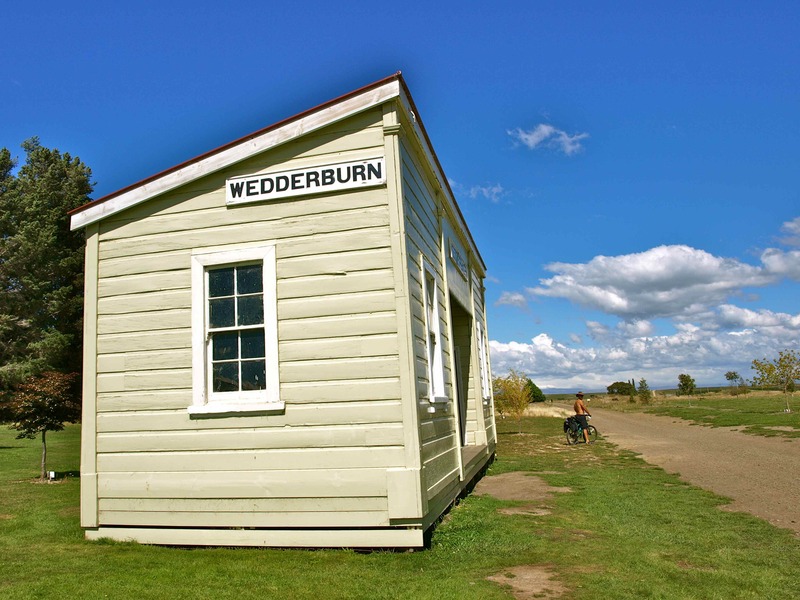 Not long after passing through Wedderburn we cycle to the highest point of the trail to then find ourselves pedalling down very long stretches of gravel roads slicing through huge areas of farmland. 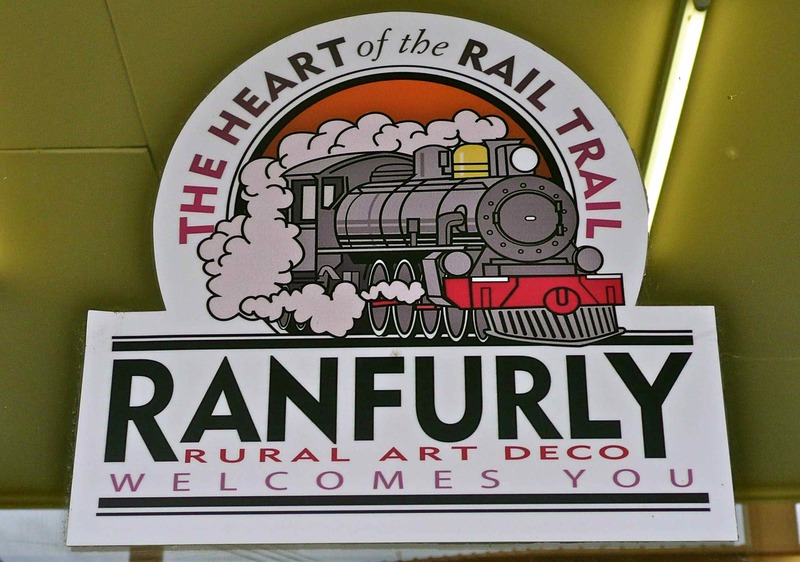 I look forward to our arrival into Ranfurly. 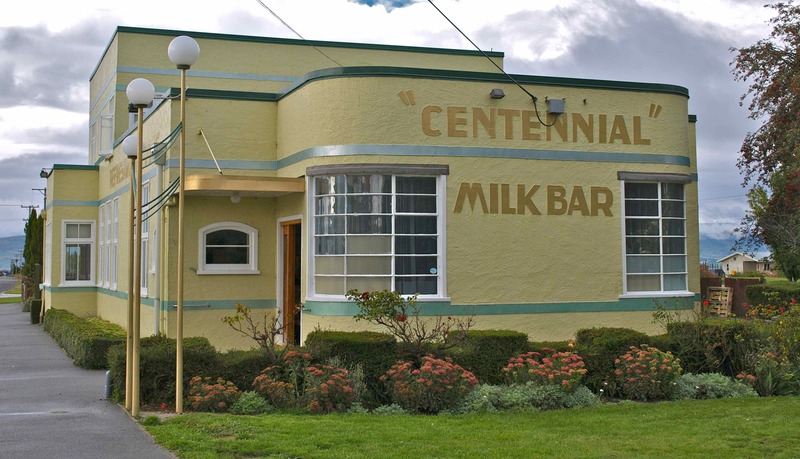 It is known as the centre of rural art deco in New Zealand and it has one of the world’s best 1930s museum. It is also where we intend to take a short break from cycling. We will grab a hire car and explore the hidden towns of Naseby and St Bathans, but more on that later! Trains use to chug their way along this route now our bicycles do the chugging. 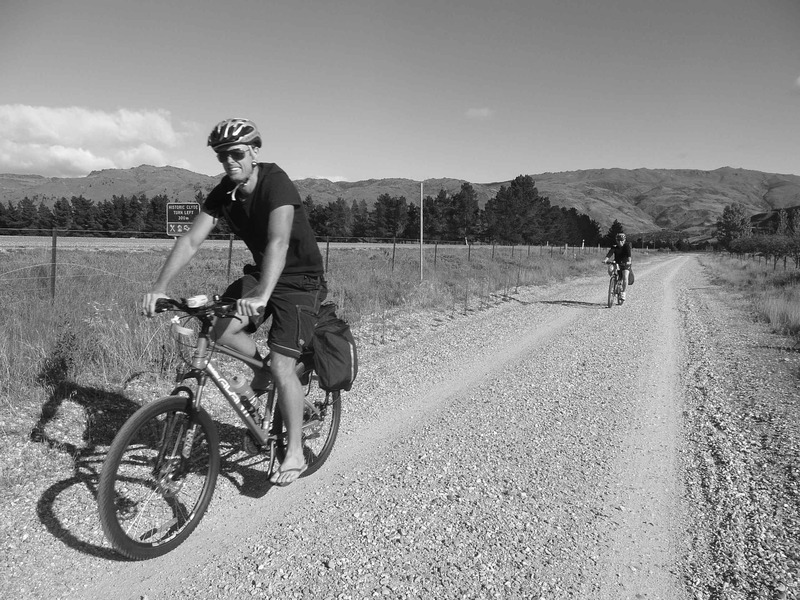 Leaving the town of Clyde our wheels squish and squelch over rotten apples that lie scattered on the gravel path. The rows of orchards and vineyards blur as we pedal with excitement and speed. Small stones fling up in the air and ping off our wheel rims awakening the sleeping insects. 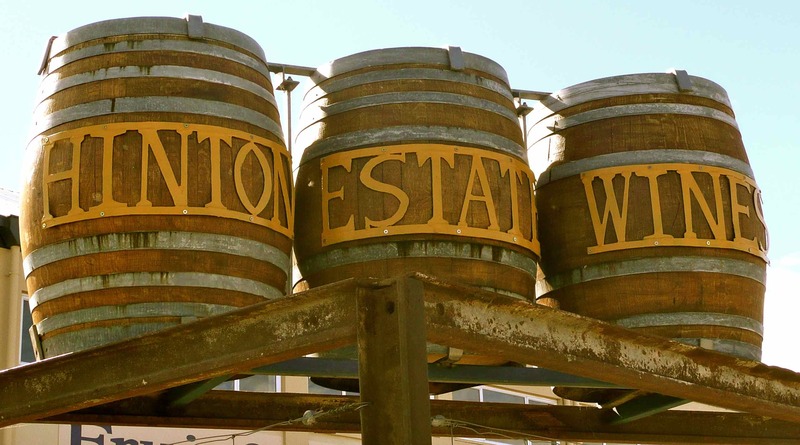 We stop briefly at Hinton Estates – a local winery for a spot of wine tasting… and it isn’t long before we find ourselves weaving our bicycles merrily through the town of Alexandra! 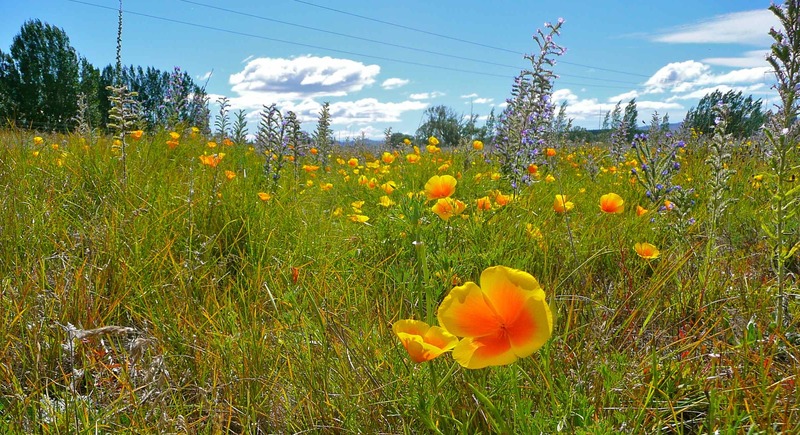 The sunny skies have dried the earth and the grasses are tinged yellow as we cycle further into the quiet depths of the landscape, with hidden handfuls of wild flowers wrapping themselves like colourful ribbons through the tarnished grass. We pause to peek into the cheerful remains of the Galloway railway station, the quaint ladies waiting room. A gentle head-on breeze begins to blow as we push ourselves up the first incline… it helps to cool us down. A rocky landscape looms out of the ground and the rolling landscape below makes the small climb worth it. The head wind picks itself up and suddenly begins to blow relentlessly as we descend onto the flat. Our speed drops dramatically. Eventually the beloved mum becomes exhausted and needs a rest. While we wait for her to get her breath back the boyfriend finds a piece of plastic rope in the grass. He cleverly ties his bike to his mums bike and bravely tows her all the way to the rustic Chatto Creek Tavern! Other cyclists passing us find this scene rather amusing and by the time we reach the pub we find we have become the talk of the day. 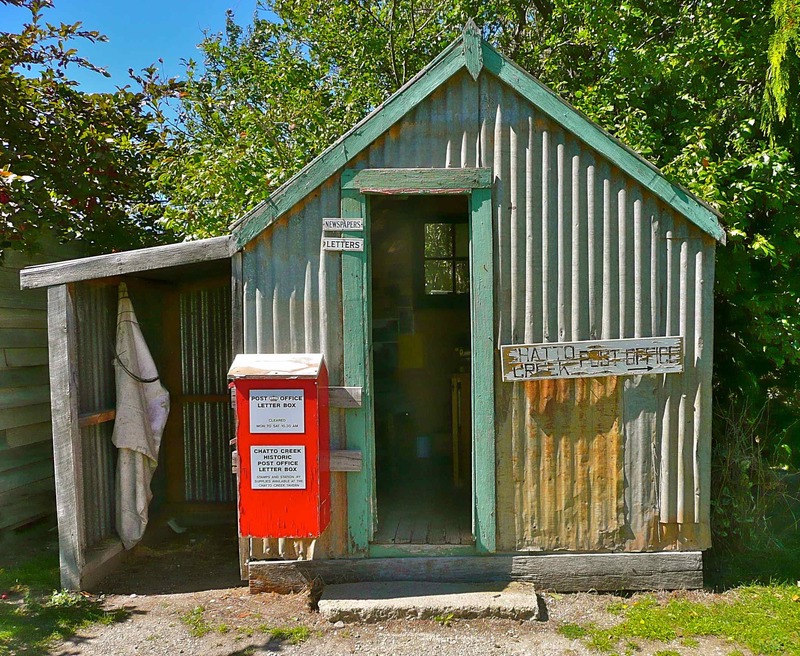 We enjoy a bite to eat, a spot of drink and the chance to send a bit of friendly post from New Zealand’s smallest post office! 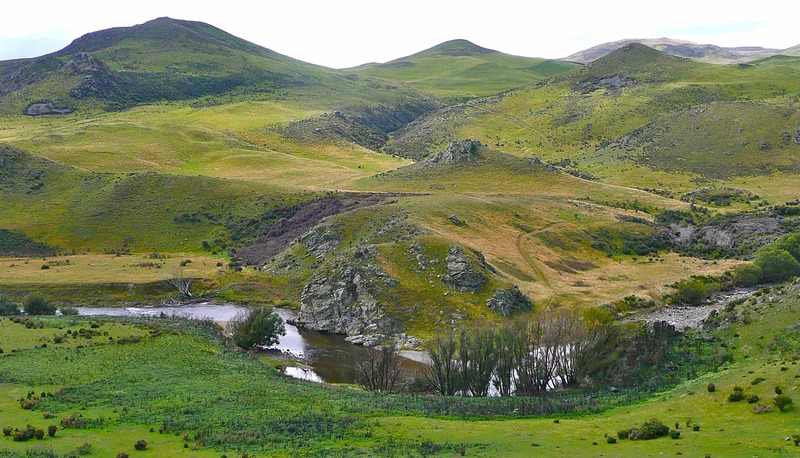 The long gravel road guides us deeper into the Otago landscape. 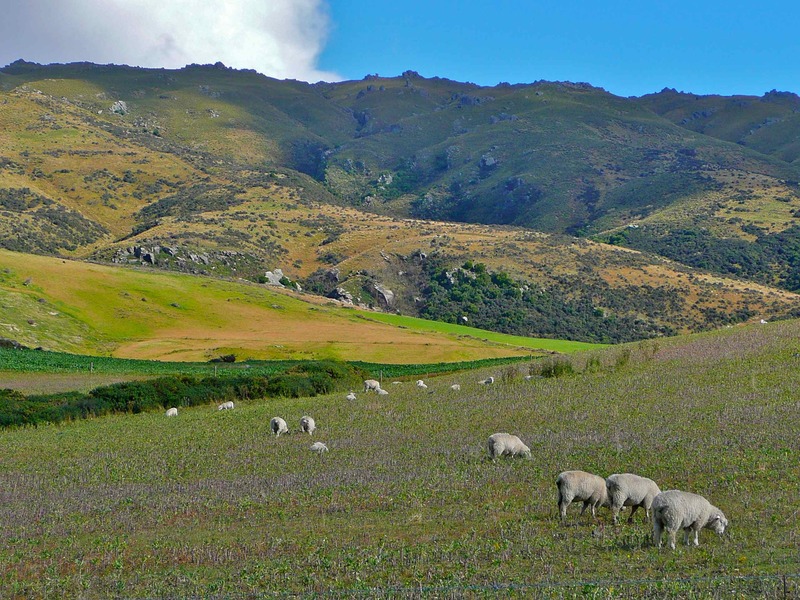 The lemon coloured grass blankets the rolling hills while the green pastures below are consumed greedily by contented sheep. 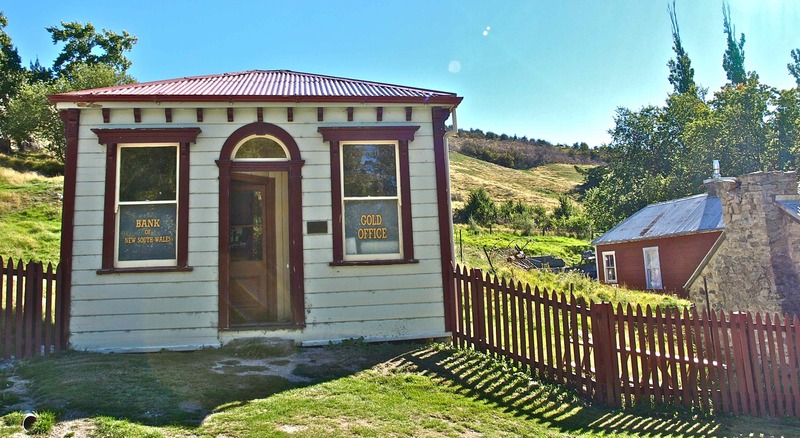 The wind has finally has returned to a small breeze yet the boyfriend happily continues to tow his beloved mum onwards to the tiny town of Omakau where we take a detour – A 6km round trip to the historic gold mining settlement of Ophir. Ophir’s main street appears unchanged. The haunting feel of the past comes alive with each building. 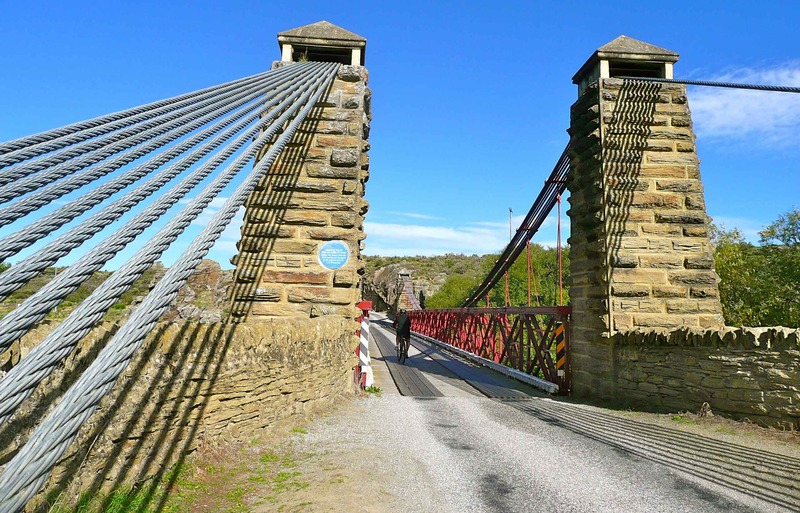 We whizz over the impressive Daniel O’Connell suspension bridge spanning the beautiful Manuherikia River. 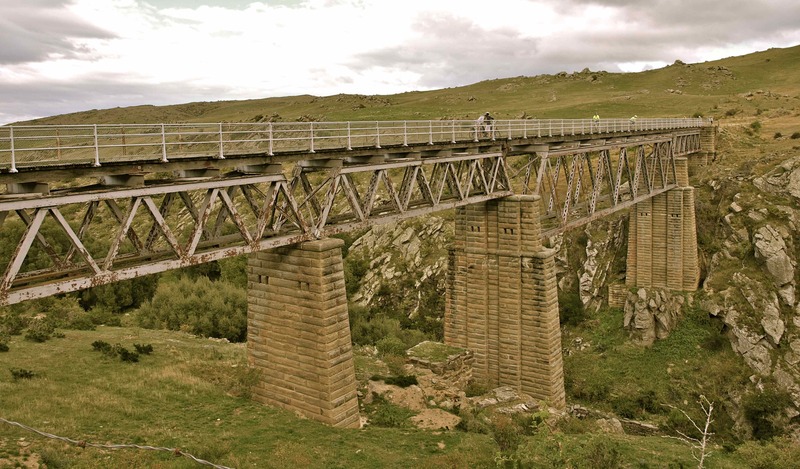 Built in 1880, it is one of the last surviving suspension bridges in Central Otago. Back on the main trail and the dust whips up behind our wheels. The evening sun warms our backs as we pedal through green pastures, over bumpy cattle stops and are stopped by a couple of squealing pigs wanting to make friends! The night sky begins to glows red as we pedal into the proud township of Lauder. We discover our accommodation is fully booked, but our hosts give us an entire house next door for the night? 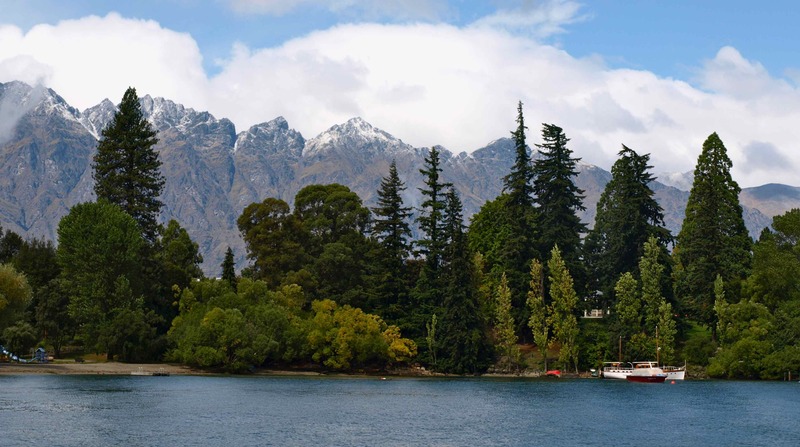 A trip to the South Island of New Zealand is always exciting. 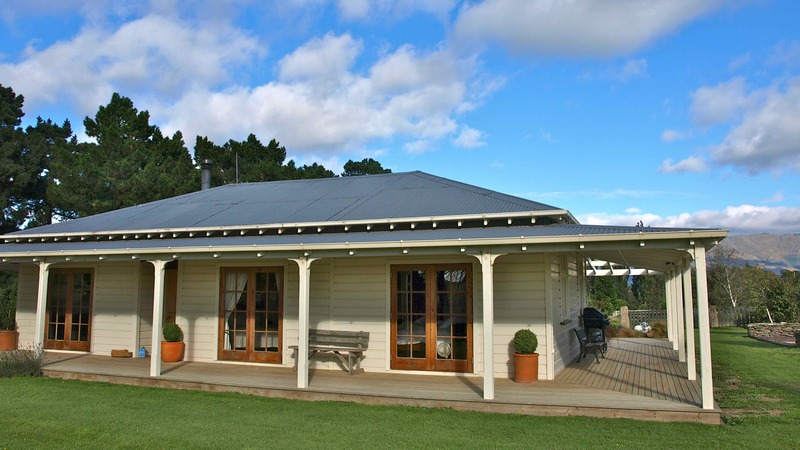 The pace of life always seems slower than the North Island. 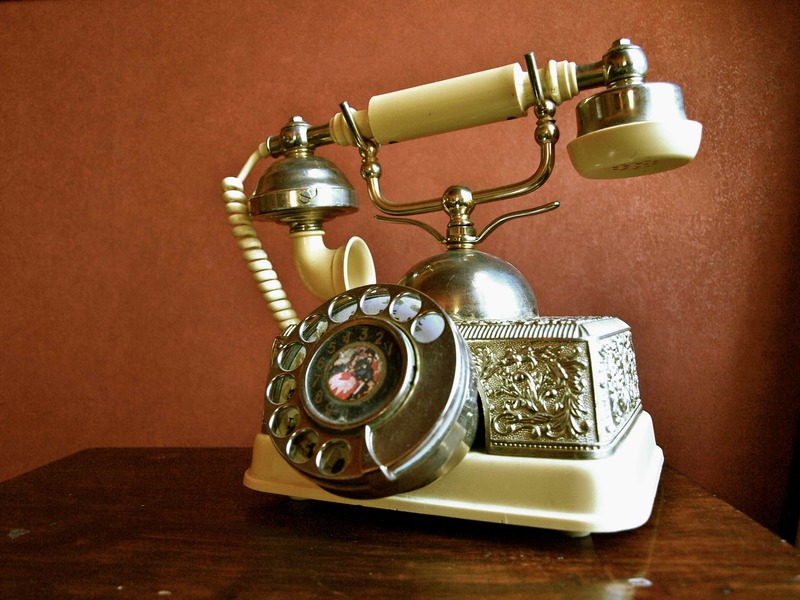 It can feel as if you have stepped back in the past where life is less complex and time has no meaning. 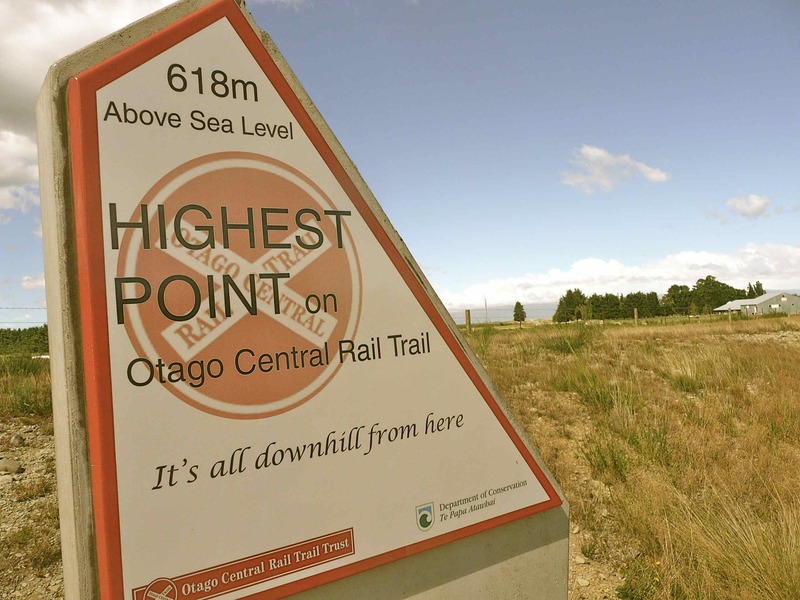 We have come south to cycle the Otago Rail Trail, one of New Zealand’s most popular cycle trails. 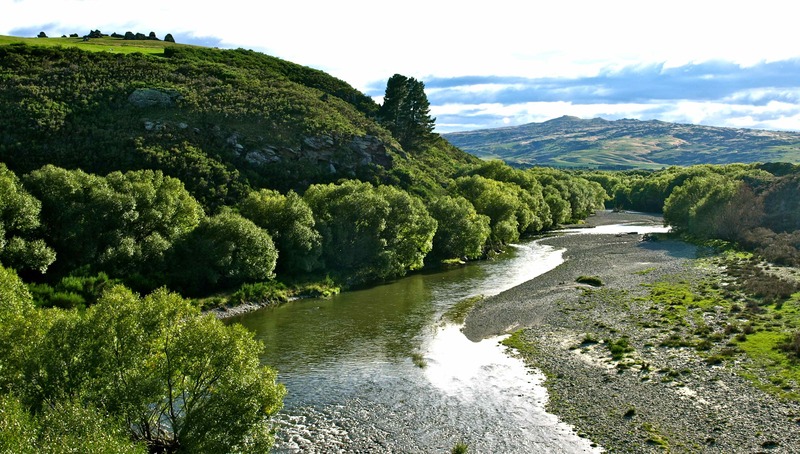 Pedalling through 150km of Otago’s history and spectacular scenery easily tempted us! The boyfriend, his beloved mum, and I have jumped on a small compact bus in Queenstown, heading for the fruit bowl town of Cromwell. The roads spaghetti their way through the dry parched hills. 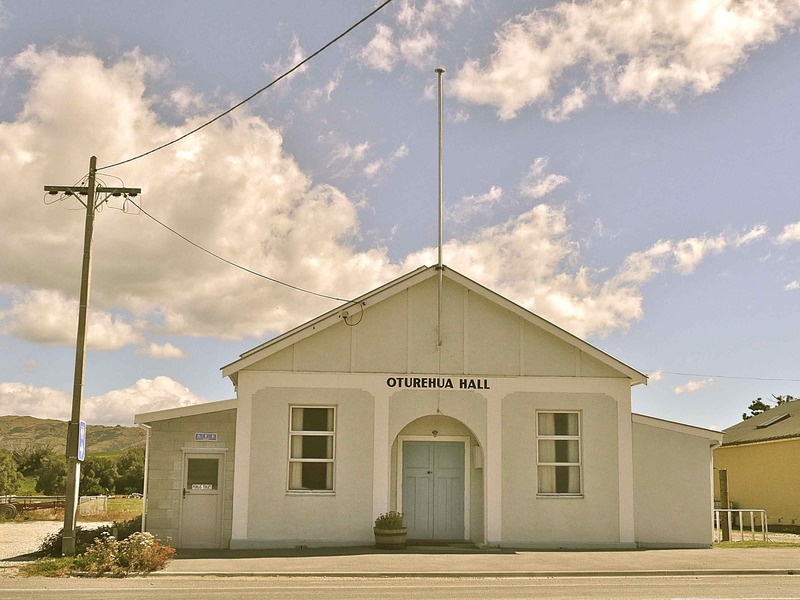 At Cromwell we are collected by the lovely husband and wife team of Shebikeshebikes and are driven to the sleepy town of Clyde. 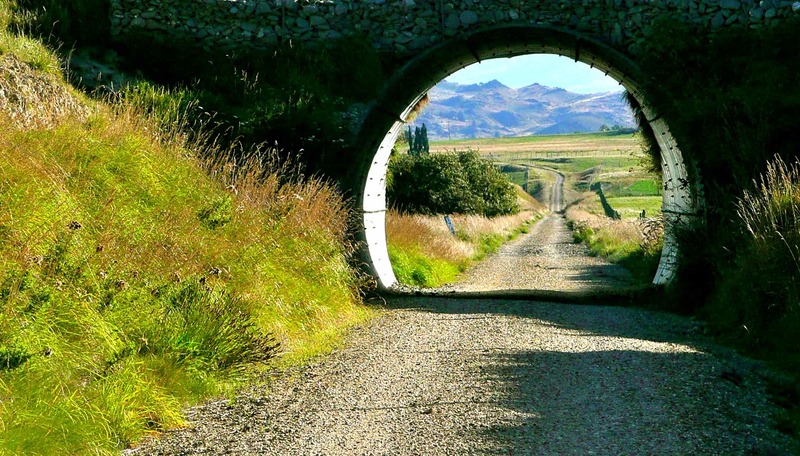 Their company has arranged bicycle hire and everything else from accommodation, collection and pick ups, car hire and recommendations of what to see and do ( all at no extra cost). All we are expected to do is pedal! The brakes are off yet my bicycle wheels are still spinning. Unfortunately my trusty computer felt as if the New Year celebrations were all a bit much so it decided to slink off and go and sulk. It took with it all my cycling photos… hence the reason as to why my blog has been so quiet. I am currently in the process of fixing the computer’s problems and I am hoping to return soon so that 2013 will be another fun-filled year of pedalling tales! !